Here’s some news I’ve been behind on. Our beloved Japanese Village on 100th Street downtown across the Westin, is CLOSED. But fear not! They have opened at a new location, nearer Red Deer, at: 2940 Calgary Trail South, phone 780-422-6083. 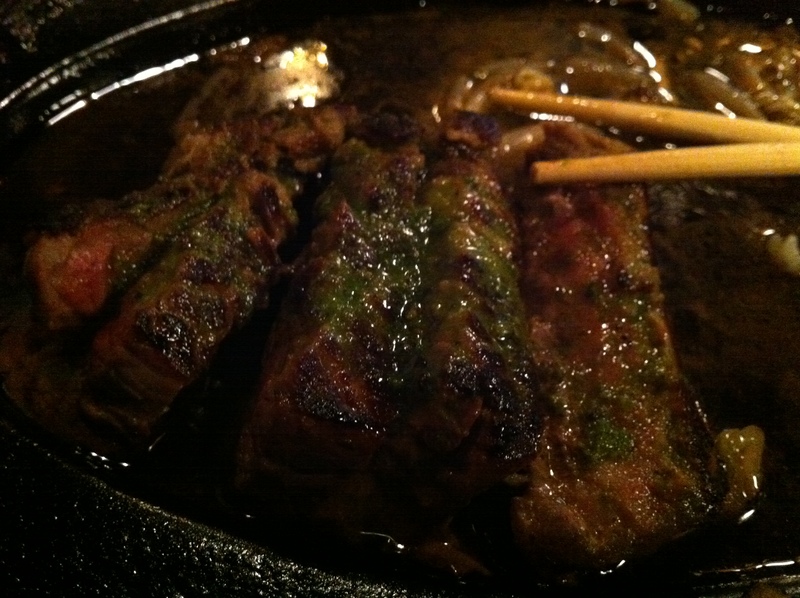 Reservations are suggested for Teppan-Yaki dining (the floor show). 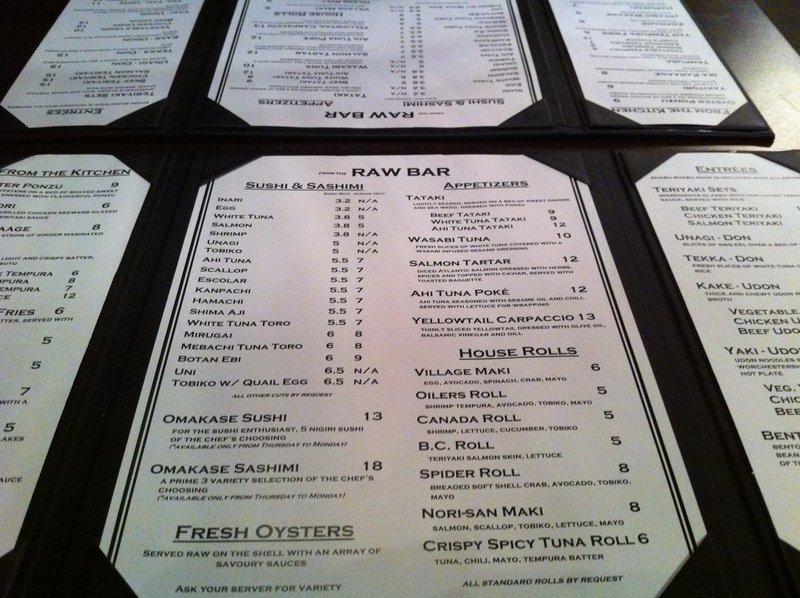 Reservations are not accepted for the sushi bar, and traditional dining area. 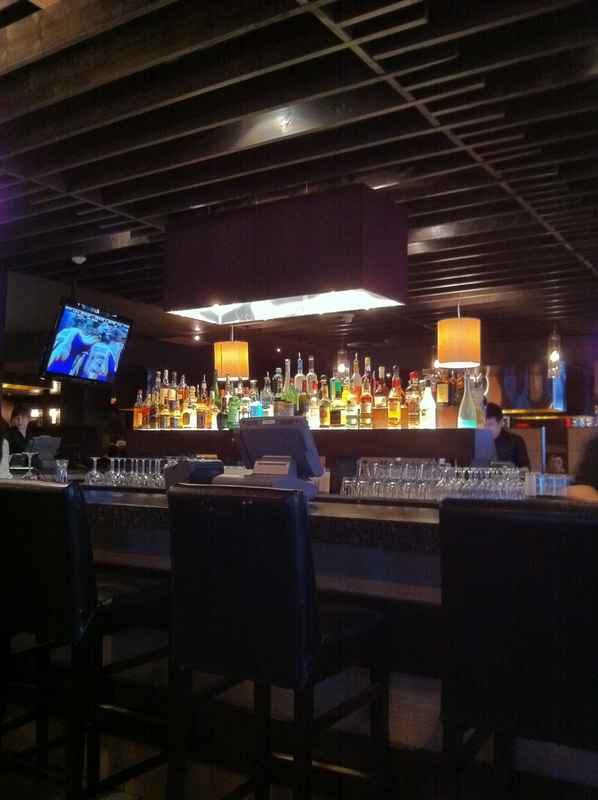 The room has the grills throughout, as well as chairs surrounding the booze bar and sushi bar. The booze bar also has a number of tables for two for traditional dining, which Michael and I always opt for. The first impression is the size. This location used to house a series of night clubs, and unfortunately, that feeling has remained. Other than a few token pictures on the wall, a piece of Japanese music on repeat over the speakers, and the dress of the cooks for the Teppan-yaki, there is nothing Japanese about Japanese Village. The focus of the gigantic room is the central bar, shown above. This would have been the perfect place to put the sushi bar, but alas, that got tucked to a back corner. The good news is, because it used to be a nightclub the washrooms are HUGE. This is an improvement if you’ve ever had to fold yourself in half to use the washrooms at their 100th Street location. The menu hasn’t changed, and our favourite, a grilled New York steak, which hasn’t appeared on their traditional dining menu for years, is still available on request. Michael and I still consider this to be the best New York steak for flavour and value in the city. 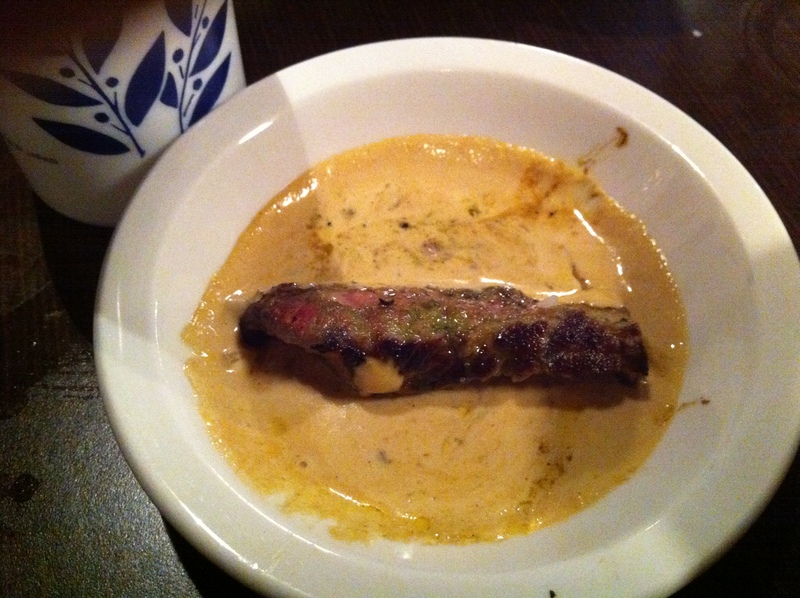 Today we went with steak in mind, and started with the wasabi tuna. You can see it above. 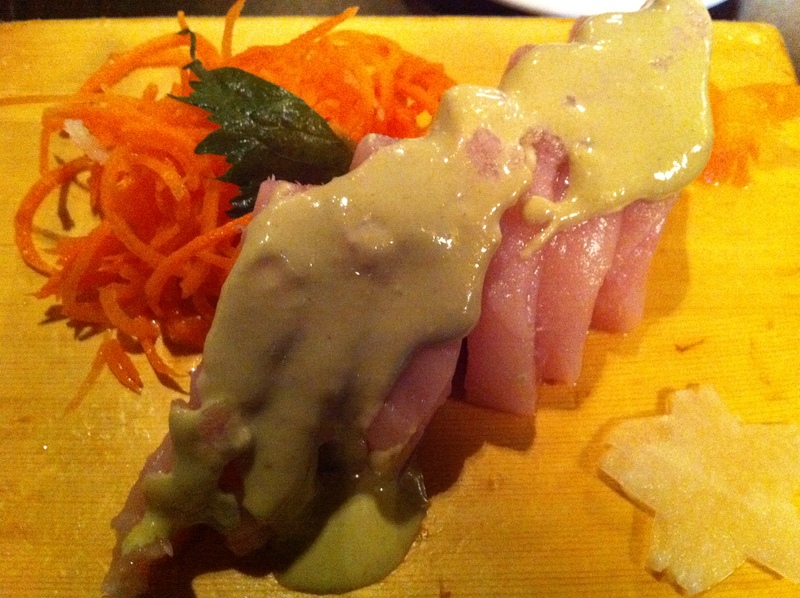 It is raw tuna with a delicious wasabi sauce – wasabi mixed with their world famous steak sauce. The sauce didn’t disappoint us, but unfortunately, the tuna did as it was still frozen in the centre. We shrugged and renamed the dish Tuna-cicles. Next up was the toe-curling delicious salmon bites. 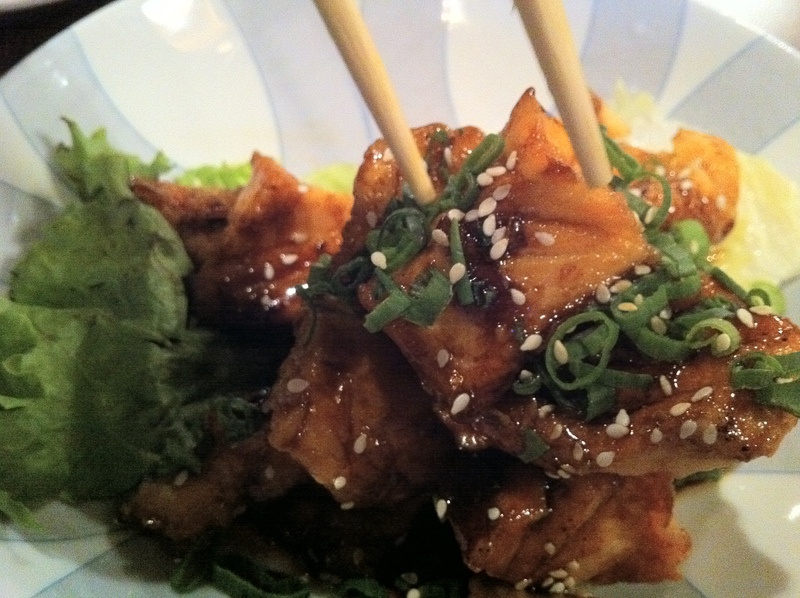 Tender and luscious pieces of cooked salmon in a teriyaki sauce. Although we weren’t first impressed with the new location, we were comforted that the menu we’ve come to love is still intact. We missed seeing our favourite sushi chef from downtown, and our server who would scold us if we drank too much sake. At the new south location, staff were friendly but appeared a bit strained, and ours only appeared to take our order or make a delivery. We were not asked if everything was okay throughout the meal, but felt we should have asked her if everything was okay instead! For large groups, Japanese Village shouldn’t disappoint. The Teppan-yaki tables were busy, and we had two birthday celebrations in the time that we we there and everyone seemed to be having a great time – including my husband who felt he needed to participate in each birthday celebration by clapping and singing along. The big central bar had people come-and-go, and were mostly those waiting for a Teppan-yaki table. Would we go again? Of course. Would I recommend it? Absolutely. Just be warned, don’t expect the peace, quiet, and gentle ambiance of the quiet sushi bar from 100th street. This place is loud, busy, and as the feel of a North American chain restaurant. Oh dear, I’m sorry to hear the original downtown location has closed. Sometimes when restaurants relocated, it is not for the better. They lose the ambiance that was so much of their charm.